Cloud Nothings at The Waiting Room, Nov. 13, 2018. Solid crowd for a Tuesday night at The Waiting Room last night. Cloud Nothings won me over with a set that intensely focused on their new album, Last Building Burning. While the album is white-hot fractured punk rock bordering on emo, there’s not a lot of melody in the songwriting to tie yourself to. It’s more about bright buzzsaw riffs and frontman Dylan Baldi screaming/croaking out the vocals that sounded like a cross between Cobain and the old punk version of Rzeznik. No, what mesmerized me about their performance was their drummer, Jayson Gerycz. With merely a snare, tom, kick drum and a couple cymbals Gerycz blew me away with what was nothing less than a virtuoso performance, a rapid-fire machine-gun that dominated every song. I could not stop watching every clever, intricate, amazing roll, fill and crash, song after song. Blazing, exhausting; like watching the film Whiplash atop a mountain of coke. The set’s high point was a lengthy feedback interlude during epic song “Dissolution”; all guitarists had their backs to the audience, their guitars jammed into amps, bending the necks, torturing the frets, while Gerycz slowly walked a beat back in, pulling it forward then giving a clinic as to what a human can do with a drum set as the band crashed back in like a 50-foot wave. Mind blown. David Nance Group at The Waiting Room, Nov. 13, 2018. 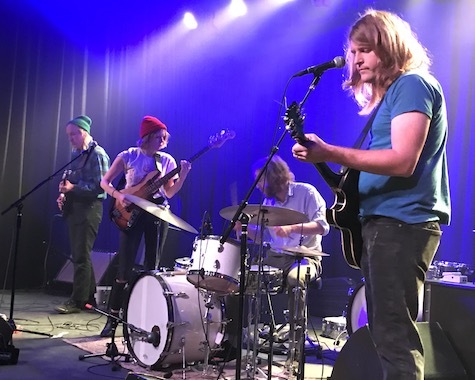 In a change from the usual set style, Nance and his band seamlessly transitioned from one song to the next by Nance pulling off one feedback wave and blending in a riff that crossed over into whatever was next. Transcendent. Someone recently asked me what Omaha bands are most likely to break into the next level of national notoriety. David Nance Group was my first response, followed by Thick Paint. Interestingly, bassist Sarah Bohling has now played in both projects. 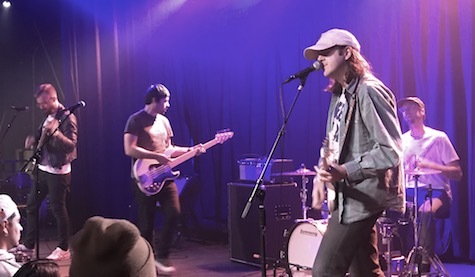 Nap Eyes at The Waiting Room, Nov. 13, 2018. Between bands Nova Scotia act Nap Eyes played a set that reminded me of a cross between Kurt Vile, The Feelies and Velvet Underground, with frontman Nigel Chapman giving us his best Lou Reed vocals. I halfway expected to hear a cover of “Sunday Morning,” one of VU’s sleepier numbers that would have fit right in with the rest of their set. Well Aimed Arrows at O’Leaver’s Nov. 10, 2018. Saturday night I swung by O’Leaver’s to see the return of Well Aimed Arrows. 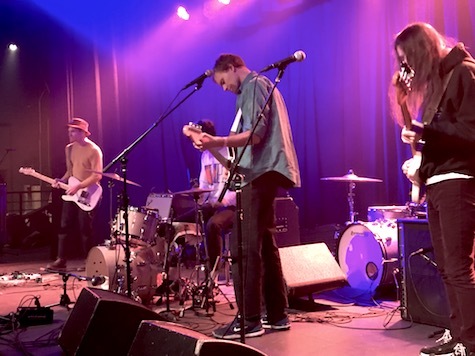 The band hasn’t played on stage in a couple years, and life being what it is, experienced a line-up change — to a trio, consisting of frontman/drummer Koly Walters, guitarist Clayton Petersen and bassist Brian Byrd. The new stripped down version didn’t sound a whole heckuva lot different than the old version, with Walters’ flat basso vox providing the perfect counter to the band’s simple, jangular post-rock arrangements. I’ve said before they remind me of ’80s-era indie bands like Pylon, Wire and early R.E.M., if not in sound than in spirit. Tonight’s Cloud Nothings show at The Waiting Room is as stacked a line-up as you’re going to find on a Tuesday night. You read about Cloud Nothings yesterday here. Based on this Daily Trojan review, expect tonight’s performance to be heavy and loud, focused on songs off the new album augmented by a few oldies. You might remember that opening band Nap Eyes played with Fleet Foxes last year at an outdoor Benson show. 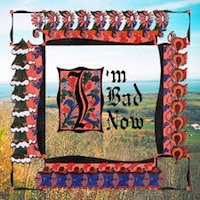 Their latest, I’m Bad Now (2018, Jagjaguwar), reminded me of The Feelies, thanks in part to lead vocalist Nigel Chapman’s drab, nasal delivery that matches Feelies’ Glenn Mercer; though energy-wise Nap Eyes is much more laid-back. Opening the show at 8 p.m. is our very own David Nance Group who is smack dab in the middle of a tour. You’ll want to get to The Waiting Room early to catch these guys. This show has a “nice price” of just $15. See you there. Digital Leather at The Sydney, April 6, 2018. For Friday night’s show at The Sydney, Digital Leather was configured as a trio with Shawn Foree in front playing synth and bass, Greg Elsasser on synths and long-time DL drummer Jeff Lambelet. If the plan was to get the crowd dancing, it was a winning combination, maybe the most danceable version of DL I’ve seen live. Lambelet, one my favorite drummers, is a massive upgrade to the synth beats heard on Headache Heaven, DL’s latest, which sounds like a collection of bedroom-recorded demoes. 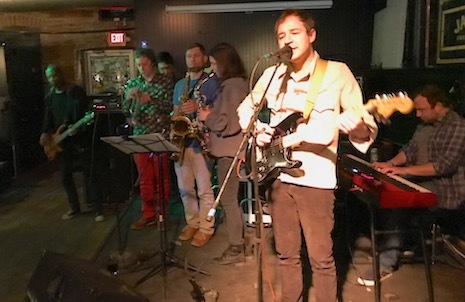 With Lambelet, and Foree adding bass, along with Elsasser, the songs were fully-realized New Wave-esque dance tracks. 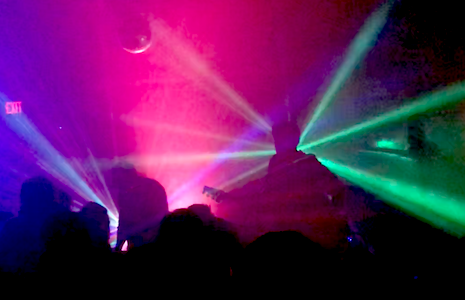 Their set was helped along with a dense layer of smoke-machine haze cut through by lazer lights — I haven’t seen this much smoke and lazers since that last Talking Mountain concert. It’s also worth noting that Friday night’s crowd was one of the largest I’ve seen at The Sydney for a rock show. The audience built up throughout the evening, starting with a gorgeous set by Son, Ambulance. Son, Ambulance at The Sydney, April 6, 2018. I’ve always thought Joe Knapp had an interesting voice, a sort of indie version of Elvis Costello, but as he gets older his voice only gets better and more in control. Good thing, too, because he’s fronting one of the best line-ups I’ve heard from Son, Ambulance over the years, including a sweet three-piece horn section and a rock-solid rhythm section swinging on a set of new material that’s begging to be recorded. Her Flyaway Manner at The Sydney, April 6, 2018. Lincoln’s Her Flyaway Manner owned the center slot Friday night. 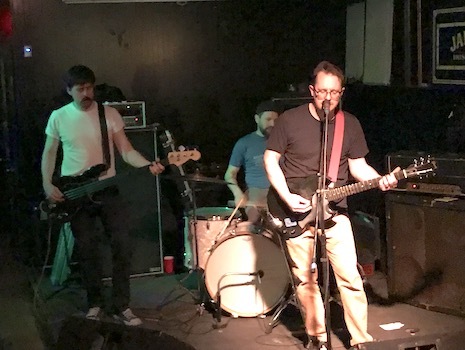 The trio headed by vocalist/guitarist Brendan McGinn crushed a set of angular post-punk rock that reminded me of Fugazi and an earlier age of Nebraska punk rock. All said, a terrific night of music brought together by between-set sets from DJ Tyrone Storm that had me tapping my Shazam app. Q1 2018 CD reviews continue. Read them all here at The Reader website. Nap Eyes, I’m Bad Now (Jagjaguwar) — This warm, melodic indie rock comes from an act out of Nova Scotia who played in Omaha last year opening for Fleet Foxes (a show I missed). 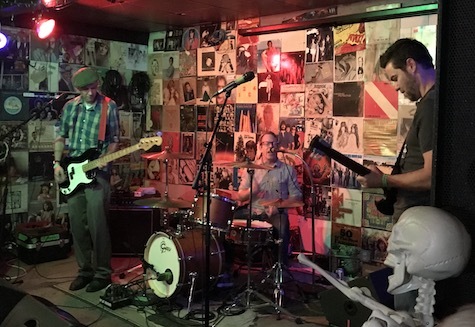 They remind me of The Feelies, especially because lead vocalist Nigel Chapman’s drab, nasal delivery matches Feelies’ Glenn Mercer, though Nap Eyes lacks Feelies’ driving, relentless rhythms that rise and rise and explode. This just sort of lays there from song to song. Tonight at The Waiting Room it’s The Bronx. The band is out supporting their new one, V, out last year on ATO. The record was produced by Rob Schnapf (Beck, FIDLAR, Elliott Smith) and has a very pro sheen to it. Still rocks hard. No Parents and No Thanks open. 8 p.m. $17.